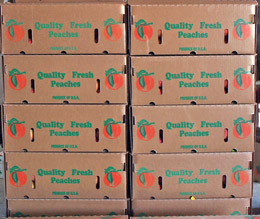 If you want to learn some secrets to growing great peaches, read this article. Note: The photo at right shows AgriGro's Super-Cal and AgriGro's Bountiful Harvest Biostimulant and Nutritional Supplement. AgriGro's Foliar Blend (mentioned above) is the name given to its commercial line (the product Bill uses) and comes in 2.5 gallons, 55 gallon drums, and 275 gallons totes. Bountiful Harvest, by AgriGro, is much like Foliar Blend, but comes in smaller containers up to one gallon, sized smaller for home use. All products, regardless if size, are available to homeowners and commercial growers. Russ: You mentioned mites. What about insects and mite problems since using AgriGro? Bill: I have had less insect problems. Healthier trees handle insect pressure better. Here is a tip. Peaches are susceptible to mites. If I find any mites I will spray a solution of 5 lbs of sugar to 35 gallons of water and it will kill mites. I haven't had to spray a miticide in over 17 years. I use sugar in a lot of my spray mixtures. It is a great insecticide and helps with bioactivity. Russ: That is a good tip since miticides are very expensive. Bill was called away on farm business, so the phone interview was ended. I want to thank Mr. Bader for the interview and for sharing his knowledge and results from using AgriGro Foliar Blend and Super-Cal Calcium. There is no magic in producing a great crop, just the experience of knowing what to do and what to use. AgriGro Products will always be there. Whether you have an orchard, fieldcrop, hayfield, or home garden, you need to try these products. Bill uses "AgriGro Foliar Blend" on all of his crops, however, you can also use AgriGro Ultra (a Certified Organic Product). Both the Foliar Blend and Ultra are sold in 2.5 gallon containers. 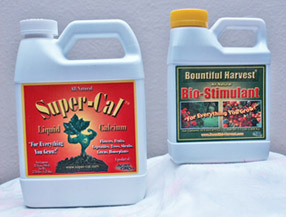 Bill also uses Super-Cal Liquid Calcium on his peach trees. Don't need a 5 Gallon Box of Foliar Blend? AgriGro's Bountiful Harvest Biostimulant is very close to Foliar Blend, but comes in smaller bottles. Florida Orange Farms and Bill Bader have hown that AgriGro's Biostimulants lowers freeze temperatures by 2 to 3 degrees. These couple of temperatures have saved a lot of fruit from freezing over the years. Thank you for visiting our page on the Bill Bader Interview. 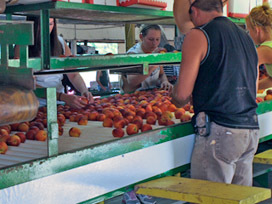 Bill graciously revealed some of his secrets to growing great peaches. Many of these tips can be used on other trees as well. 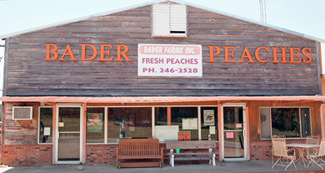 If you are ever in the boot heel area of Southeast Missouri, be sure to drop by Bader Peaches in Campbell, MO. Refer back to the Bill Bader Interview often and be sure to visit our other pages on AgriGro and our extensive pages on home and commercial turf management. Here is where you can purchase AgriGro Products for your lawn, trees, and everything you grow. Lawn care products that really work. You Have Got to See these Certified Lab and University Research Results! 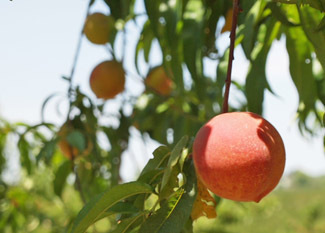 See why the owner of the largest peach orchard in the Midwest has used AgriGro Products for over 20 years. Bill has 1100 acres and almost 110,000 peach trees. They are the sweetest and juiciest peaches I have ever tasted! Read how to use all listed products along with precautions and mixing rate.